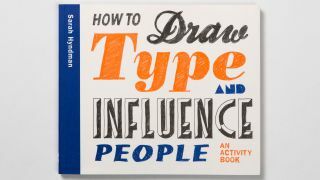 How to Draw Type and Influence People is packed with exercises that encourage you to experiment with typefaces. One of the most effective ways to learn about something is to get stuck in practically. That's certainly the thinking behind How To Draw Type and Influence People, the latest book by Type Tasting founder Sarah Hyndman. Published by Lawrence King, this fun and informative book encourages readers to experiment with typefaces to gain a greater understanding into how they affect our everyday lives. Just think about it: typography is everywhere and it evokes an emotional response even before you’ve read the words. You’ve probably encountered a range of typefaces before you even landed on this article, and each one is designed to achieve a specific goal. As part of her mission to make typography fun and engaging for everybody, Hyndman’s book is an accessible read that both general readers and seasoned graphic designers can enjoy. Taking readers on a whistle-stop tour of typography terms, the book covers the basics of families, serifs, letterforms and more. You'll even learn the difference between fonts and typefaces, so you'll earn a place in the good books of your more pedantic design friends. Backed up with a visual type glossary, the activity book is an invaluable resource for those who want to learn about typefaces and even create their own. And getting creative is at the heart of How to Draw Type and Influence People. Each chapter is filled with exercises that invite you to pick up a pen or pencil and have a go at designing your own typeface. Throughout the course of the book, readers will have a go at creating typefaces to communicate a tone of voice, a sense of rebellion, and even a smell. Can you conjure up a font for a magic potion? Running at 128 pages, this beautifully illustrated landscape book is almost too stylish to vandalise with your own haphazard scribblings. But if you want to get the most out of it, you're going to have to take the plunge. Topped off with a further reading list of useful books and websites (including the one you're on now – blush), How to Draw Type and Influence People could well be the most fun way to take a step into the world of typography. If this sounds like the book for you, Hyndman is launching it tonight at the Tate Modern Terrace Bookshop from 6pm, or you can buy it here.